Virginia Hill moved to Ocala, Florida in 1996. 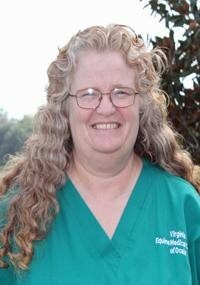 She has twenty five years experience working in the veterinary field: ten years in small animal and fifteen years in equine. Working in the laboratory is her passion. Virginia grew up in Arkansas where she met and married her high school sweetheart. They have been married thirty seven years. Her three children and five grandchildren are the joy of her life. Virginia is an artist and teaches painting classes part-time at a local arts and craft store in Ocala. Animals are her favorite subject matter. In her spare time, she loves being outdoors spending time with her dogs and her horse.